"I'm convinced that Howard Gardner was right when he suggested that all leaders need chances to retreat to the mountains. I hope this book gives you metaphorical mountains. I hope that Leading Well allows you to step back from the hurly burly of school leadership, to see far horizons, to breathe a new kind of air, and to return home with new energy and vision. And more than that, I hope the book helps you give the teachers and children in your care their own metaphorical mountains; because in the end, good leaders create leaders." 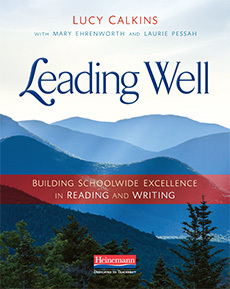 In Leading Well: Building Schoolwide Excellence in Reading and Writing, Lucy Calkins draws on the transformative work that she and her colleagues at the Teachers College Reading and Writing Project have done in partnership with school leaders over the last thirty years. Travel to any corner of this country, inquire about the schools that are winning acclaim for their joyous and rigorous schoolwide literacy work, and you’re apt to find yourself hearing about the results of the remarkable community of practice that has taken root around reading and writing workshop instruction. This book, like the work of the Teachers College Reading and Writing Project itself, is deeply research-based and principled, while also absolutely practical and real-world tested. Leading Well will provide you with the inspiration and energy you need to rally your teachers to outgrow their own best teaching practices and tackle predictable challenges. Additionally, Leading Well will remind you that you are part of a vibrant community of practice. You’ll learn not only from Lucy Calkins and from contributing authors, Mary Ehrenworth and Laurie Pessah, but also from talented, tenacious, and imaginative school leaders who are creating new horizons for the world of education. The book is for school leaders who’ve invited their teachers to join them in the exhilarating work of adopting a dynamic, rigorous, student-centered language arts curriculum. It is for school leaders who have taken on the challenge of transforming their whole school into a place where everyone’s potential, for learning and for growth, is sky high.